As if you need yet ANOTHER reason to love or to head to your closest Target store, I'm here to give you one. I don't know many girls that hate Target...it's just one of those things. Today, you can actually make your unhealthy obsession sound like it's a good thing. Allow me to explain. One of the best decisions I've made when it comes to shopping was getting a Target Red Card this past summer. The red card is different than your typical store credit card. It's actually a debit card that allows you to save 5% on every purchase. On top of that, it stores your receipts to make returns even easier and you get free shipping on all Target.com purchases (no minimum ladies). This was a no-brainer to me...SOLD. I figured if I'm already spending on average $50+ each time I go to Target, I might as well get the debit card and save 5%. I can't tell you how much I have saved over the past 6+ months, but I can tell you that it's a lot of moolah and my husband is extremely happy about it. What I like to do is write out the things we need at the beginning of every week and then I will go straight to the Cartwheel App to see if there are any coupons for those items. Most of the time there is a coupon for what I need because the app has over 700 coupons available. Seriously. You just log in via your facebook account or email then you have access to all of the coupons. 20% here...10% there..it all adds up! I also like to use the app when I'm shopping in the store. My favorite thing about this app is that you can use your iPhone (or Droid) to scan any item's bar code to see if that item has a Cartwheel offer on it. How awesome is that? Besides scanning the bar codes, if you are at home making a list, you can browse by category or search for a specific item, save the coupons you want (they are stored under "my Cartwheel"), then when you are checking out you just have the cashier scan your bar code and the savings come right off. And did you know that one of our favorite bloggers THE Kelle Hampton has her own collection where you can shop her picks? I'm always using this app when I shop at Target now. It's too easy not to, and when I see my receipt with multiple savings on it I can't help but smile and feel like I'm the smartest woman in the world. Go ahead, shatter my thoughts...this is just common sense. The trick is (with coupons in general) is to just make sure you aren't buying random things you don't need because there is an coupon for it - that's where my list comes in handy. It keeps me focused on the things we actually do need. Or at least it tries to. 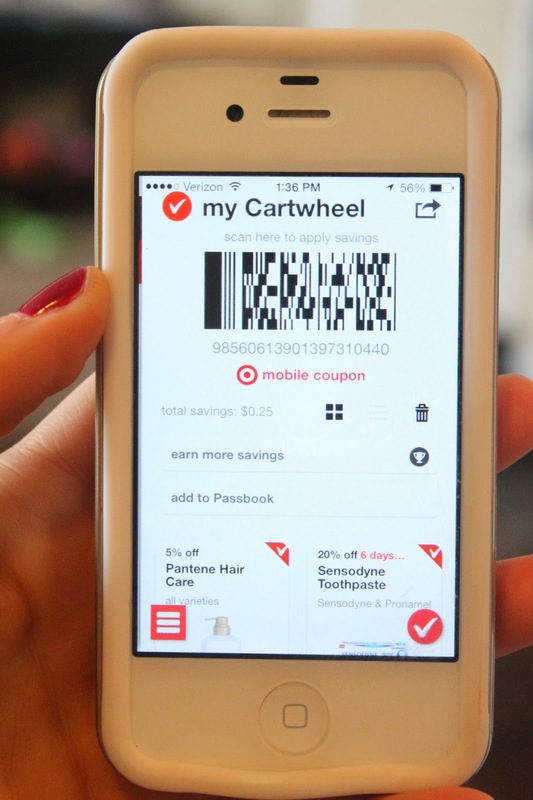 Have you used the Cartwheel App yet? If not, you better get on it! **To be entered for a chance to WIN a $1,000 Target GiftCard®, tell me below in the comments what your favorite things about Target is! i love that target carries collections often not found anywhere else, like sugar paper since i don't live in LA! I'd have to say my favorite thing about Target is that I can get just about everything all in one place and usually for a pretty good deal. I like Target because you can get cute clothes and groceries in the same store!! My TWO favorite things about Target are 1) of course the amazing prices on every item I could possibly want. and 2) how "inviting" it is. That may sound weird but I love a store that is organized, and makes me want to shop there. Can't stand going somewhere where items are thrown all over the place. Target offers the affordability I need on my budget but makes shopping fun! I love Target- amazing clothes and phenomenal clearance racks are my favorite part! What's not to love about Target!!!! I love that it's a one stop shop where I can get everything my family needs! I would have to say that it is my favorite "one-stop shop" and that I can always get great deals on stuff for the home, and everything is cute and pretty good quality! I love one that they have the printer ink I need and at a good price. I also love that it is a place to get all sorts of necessary items from groceries to make up to prescriptions to exercise equipment. I also love the Cartwheel app! I also love their seasonal housewares that make it affordable to switch things up every few months. I love target even more now because of their maternity section. Liz Lange Maternity has been a life saver! Cutest clothes that make me look good when I don't feel so great. I love Target because it's clean and everything is organized. Target has has the best clearance racks too! Cartwheel is the best. It's the most amazing feeling when I have a manufacturer's coupon, a target one and there is a cartwheel for an item, when i swipe my Target card and the number goes down! Love it haha. I love that I can get everything from my puppy's food to a hot new outfit all in one stop! Loving their home decor! The white and gold speaks to my heart! Target is my happy place. I love nothing more than stopping after work on a Friday night, getting a coffee, and just strolling through the aisles. I find the cutest clothes, functional workout gear, latest magazines, delicious snacks, beautiful home decor, and of course pamper-worthy beauty products. I recently got my red card too and I love it! I haven't used the cartwheel app yet though. My favorite thing about target...hmm...their designer collaborations! Ahh nothing beats a Target cardigan! I love basically everything about Target! You know you really love Target when on a random Saturday you and your girls choose to just stroll around the store, hitting every.single.section. It's almost a tradition now. I love that I can find items that I can't find elsewhere, especially organic foods! The best things about Target: 1) amazingly cute stuff that you can only find there! 2) The best holiday selections ever! 3) Fabulous prices with great ways to save too! I just adore Target! 2-4 trips per week is not unheard of for me! The cartwheel and target brand baby diapers & wipes are my favorite things! I have the Red Card credit card, and I love it! My favorite thing about Target is that I can get pretty much anything there - I can spend hours browsing clothes, makeup, home goods, etc. Besides the fact that they have everything you could ever need? I love their holiday decor and general home decor, clothes, makeup (e.l.f.) and shoes! I will most def be downloading this app!! Target is AWESOME! There really is no other way to describe it. I can get every day household necessities and super cute unique items. I think everyone can agree that they can go in for a few items and come back out with multiple bags. I also love how organized everything always is!! Target knows whats up!! I find myself in there several times a week... I love that I can do all my grocery shopping at Super Target for much cheaper than going to Publix. I also love that I can get household items, clothes, shoes, holiday decor, home decor, electronics, etc.. every time I'm there I end up buying a bunch of things I never intended on buying. Their variety is amazing and always inspires me. everything. most of my house and closet is decorated with target gear. it's my fave, by far! I love that it's a one stop shop for my families needs. My pooch Dixie get some fab treats and so does my hubby, and well, of course me!! I also love that they have killer clearance deals on just about everything making it even more cost effective to shop there. Plus, their commercials rock! I love the Target debit card when I weekly grocery shot there! you nailed it...i do the same thing...just one more reason for me to never go to walmart ever again lol. ummmm best giveaway ever. the question really is what don't i like at target the answer is nothing. my favorite item currently being their tinkerbell slippers. I am in love with their home goods department right now. It seems like everything I'm finding in catalogs and pinterest has a cheaper version (and a double score from my Cartwheel app and Red Card). We just redecorated our living room 90% from the Target home goods department! I love the extra savings with the RedCard and the free shipping!! I love the end caps and the RedCard. Free shipping and 5% off is awesome! I don't think I have just one favorite thing. It's so hard to pick just one. But I'll say I love their home collection (towels, curtains, rugs, décor), and their kids section. And movies. And books. I could just go on and on. I really should get the red card because I spend way too much money their every year. My daughter and I have a mommy/daughter Starbucks and Target date every Thursday. She loves it as much as I do. And she's 2. I love it because it's a one-stop shop! Target usually has everything that I need and I don't have to make multiple stops and multiple stores. I love Target for their decor mostly. And their shoes don't hurt anything. What's not to like about Target?! But I love that it's a one stop shop for me. I get all my groceries, household goods, and pretty much all my apparel there too. I use Cartwheel all the time! It helps me save even more at my favorite store. I think I love Target because they have just about everything I need at reasonable prices. I can find clothes for work or the weekend as well as makeup, electronics, accessories and groceries. And it always fits my budget! I love Target because of its prices, and selection. It's a one-stop shop for everything. Great giveaway! I love Target carries everything I love and need, it is a perfect one-stop shopping spot. I love Target because they have upscale looking stuff, for cheaper than upscale stores. I love pretty much everything at Target, but I'd have to say their shoes and bathing suits are my favorite! I love Target for the fact that I can every single thing I need in one store. Cute clothes and shoes, groceries, make up and other necessities right in one stop. But my FAVORITE thing is the Dollar Spot. I have this addiction with creating goodie bags for the kids at my son's daycare and this is my go-to-spot for what I need for the goodie bags! What's not to love about Target!? :) Their clothes and the dollar section!! What I love most about Target is their home decor section. Such cute and well designed items, but also very well priced. What I love most about Target is how clean it is and organized. The general aesthetic of Target overall makes for a pleasant shopping experience :) Nerd alert!!! I love what Target is doing with their home decor. The gold detailing gets me every time! I love walking through and finding the clearance sections, there is always something good. My favorite thing about target is the ability to get practically all of my household needs in one shop. Also the cleanliness of the stores. My favorite thing about target would be that as a college study it is the perfect study break with your roommates of course. We all compete for who can spend the least based off of the amount of snacks we need, new socks we want, and the super cute clothes we just have to have. My favorite thing about Target is that they LITERALLY have everything you could ever want! One stop shopping, holler!! My favorite thing is the kids' clothing department. I love that I can go one place to find cute clothes, boring necessities, home decor, and that one-off thing you forget to grab at the grocery store. My favorite thing about Target is the great selection at reasonable prices. oh target, how i love the. How about how they are my one stop shop for food, fashion and every day necessities?! I love that Target is an-all-in-one stop! I recently just downloaded the Cartwheel App and saved about $35 on a $100 purchase. I never considered the Red Card, but after all it's benefits, I think it's something I'm going to do next time I'm in Target! If I won the gift card I would spend it on baby and nursery stuff! We are expecting our first in May and are just starting the nursery! Since it's our first we need everything for a baby! This gift card would help out SO SO much! It is truly one-stop shopping!!! I love EVERYTHING about Target! I always go in for a few things and come out with a cart full!! I love their furniture and design pieces. My favorite thing about Target is the affordable clothes--fun clothes and work clothes. Target is wonderful! They have EVERYTHING! I love getting beauty supplies, clothing, and home decor! My favorite thing about Target is I can buy a really cute dress and dog food in the SAME store. Amazing. I couldn't even tell you what I DON'T like about Target (except, maybe that I never spend the amount I set out to spend, but rather much, much more!). I have the redcard & cartwheel app as well & LOVE them! Their threshold line furnishes my home & their merona brand graces some of my closet space :) Thanks for hosting giveaway! no i haven't tried the app. don't think i will either. I love that I can purchase everything I need/ want in one stop. Nothing beats a store where you can buy a bathing suit, school supplies, groceries, and starbucks! I like the one-stop shopping. Tees for layering, birthday chards for cheap, and laundry detergent all in one fell swoop! Target is my happy place...I love everything about it!! My favorite part about shopping at target is the awesome deals and the threshold line, beautiful home decor for reasonable prices!!!! Love their nate berkus lline an absolutely love all the cute clothes and shoes they have! Oh man I'm thinking I need to get a red card. Store credit cards make me nervous for some reason buuut you make a pretty convincing argument. The home decor is probably my favorite part - every time I walk by I swear that whatever they are featuring is how I will decorate the future home I am saving up for! My favorite (and sometimes most dangerous) thing about Target is the $1 bins at the front of the store! I love the cute decorations and sometimes every day items that are so cheap! I've recently started using the cartwheel and I'm figuring out how to use it with my coupons and sales plus the red card and the savings just keep adding up!! The dollar section! :) Though with this gift card, I'd be splurging on some home items…especially from the Threshold and Nate Burkus lines! I love target for their shoes and home décor!! I love that they seem to have unique things that you can't find at Wal-Mart. The things that look high-end, but are still at a reasonable price!! I love Target for all the cute decor items, their grocery store, and the fact that there are SO many ways to save. I love Target because they have such a big variety of items and at great prices. I love the selection of groceries at target. I love that it's basically one stop shopping for so many different needs. I love Target because of all the awesome clearance items I can find every time I go in there!! My favorite thing about Target is the home decor department. My fave thing is that Target is a one stop shop. Their home accessories are like none other! I like Target because you can get groceries, clothes, home accessories and toys all in one place. It'a a one stop shop. I love storage bins, clothes,and housewares at Target. I am always able to find home decor and soft goods I love at Target. I like Target to purchased groceries. home décor and items for my dog and cat. I love everything about Target. My favorite though, is the selection of affordable and sassy clothing! I love their cute home wares and kitchen gadgets! Every time I'm in there I end up wandering through just daydreaming about the things that I would put in my apartment! I love that you can find basic items, but also fun, cheap trendy accessories and clothes.. plus pick up toothpaste. It's funny to me that Target and Walmart are basically the same type of store because Target seems to be 1,000 times better. Haha. I love that target has trendy items for affordable prices! Hi Katie, I've not yet used the app so yes, I'd better hop to it. Thanks for the giveaway! Whooo love the Cartwheel app, my REDcard and Target in general! I love that I can get everything I need in one place. I like the variety of products they have and the store is always neat and clean. Fave thing about target is the ease to find things and the price! I love that Target has everything I need in one place, and they have great prices! I love how walking into Target feels like I'm walking into my store. Target always feels so personalized for me. The end caps always include just what I wanted, their clothing is on trend, the home goods (swoon!) and of course, the great prices. One of my favorite things about Target is walking the clearance end caps, better yet when I have a coupon & or Cartwheel offer. I love that they have lots of dollar deals and clearance. I like the low prices at Target. I love Target because it's one stop shopping, but it's also quality shopping! I can find just what I need, and I know the price will be right, and the quality will be high! My favorite thing about Target are the good deals I get on the food items -- cereal, soup, coffee, etc. Mine also has a Starbucks in it...double whammy!! i love that target is so cooooool. they have such unique items in their store! I like that it's a multi purpose store. I love their home decor. I like their location and their promotions. I love all the great deals that Target has! Perfect place to browse and find neat things. I like that the stores are clean and bright--certainly not claustrophobic shopping there! Oh my goodness! I pretty much love everything about Target, but mainly their jeans. Target is the only place I can find jeans that fit my body perfectly!